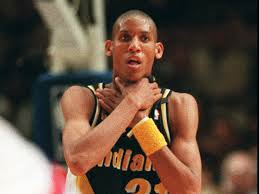 I was assigned to write something on Reggie Miller for some occasion or other. Having written so much it was difficult to come up with anything new. But then I thought of this. You can have the 8 points in 8.9 seconds or the 25-point fourth quarter at Madison Square Garden, the pair of overtime-forcing heroics in New Jersey, the 41-point series-saving performance against Milwaukee at Conseco Fieldhouse, or any of those other classic playoff memories Reggie Miller left in the wake of his 18 seasons with the Pacers. The echo that lives in my brain is of his voice. In the hallways of the fieldhouse. On practice days. Gripping stuff, I know, but what made Miller great, what made him a Hall of Famer, was his raw enthusiasm, and that enthusiasm was most evident to me in the private moments when he had no reason to be enthused other than because he felt like it.